It's trendy to say that you are looking for something off the beaten path but are you really? I had the incredible opportunity to explore a new corner of Italy two weeks ago. This does not happen very often as in the past 25 years I have covered a good deal of the country that has become my passion. 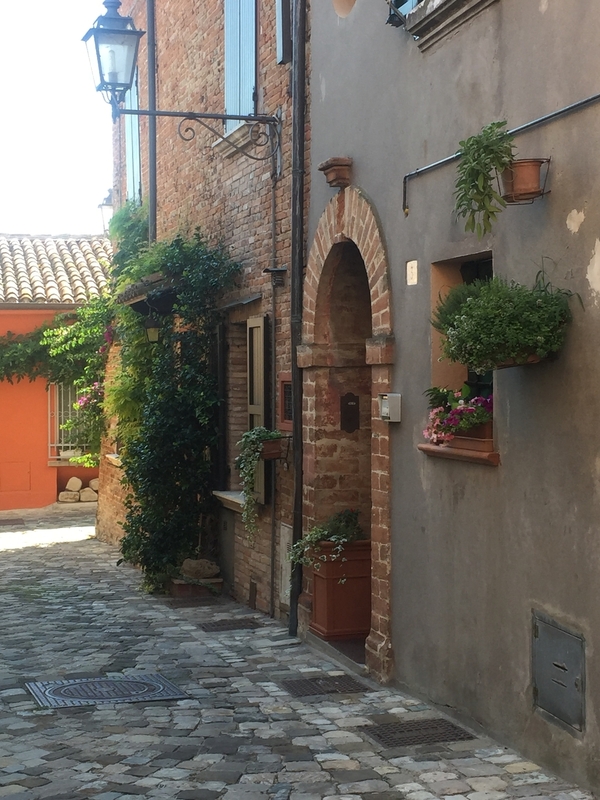 So you can imagine how delighted I was when Monica from Cook in Venice and Maria Regina from the Hotel Eliseo in Igea Marina invited me to be a part of a blogger tour to introduce us to the region of Romagna. Unfamiliar train station, unfamiliar towns that dot the train route. For the first time in years I felt myself uncertain about travel in Italy. I was cautious when approached by a man in the station asking me for assistance. I clutched my bag on the train and refused to let myself sleep as the local train chugged south east from Bologna. I felt my tension go away the minute I got off the train and was met by the beautiful and kind Francesca who was helping our gracious hostess Maria Regina with the organization of the trip. We walked to the hotel and I immediately knew this experience was going to be quite different from the tourist routes that have become so familiar to me recently (you know - Rome, Florence, Venice, Cinque Terre, Amalfi Coast). My heart began to soar. This is Italy. The Italy we all search for. The authentic, the unspoiled Italy. Bellaria Igea Marina is a seaside town and while the height of the summer season had passed, the beaches were still bustling with vacationers (mostly Italian and German). It is a place that calls you in and invites you to relax and stay a while. There are stretches of white sand beaches lined with colorful umbrellas. Each beach area has its own changing cabanas, a bar and amusements - play yards for the kids, bocce, volleyball, ping pong and more. I saw friends chatting the day away on their lounge chairs, Zumba on the beach, a pop up flea market at the edge of the water. It has the feel of a true beach town. The town itself is filled with gelaterie, cafes, shops selling beachwear and beach toys. The true beauty of the area is that just beyond the seaside community is a world of undiscovered culture and art. In less than an hour, you can visit Ravenna and its spectacular mosaics or the Republic of San Marino. We took a trip to the town of Santarcangelo, a charming town that has a fascinating labyrinth of caves underneath the town (156 tunnels stretching over 6 km). We visited a vineyard owned by a young couple who are embracing the agricultural lifestyle on the Romagna wine trail. We learned about the making of formaggio di fossa and saw hand stamped linens being made. We were treated to the traditional delicious food of the Romagna (and even got to try our hand at making some). We took part in the festival of the piadina (the traditional flatbread of the region) and we felt welcomed by each and every person we encountered. Romagna exudes an air of authenticity and true Italian hospitality that has largely been lost in the large, more frequented cities and regions of Italy. If you are looking for English translations everywhere, McDonalds or the haute couture fashion houses that line the streets of Rome, Florence and Milan, you have come to the wrong place. If instead the idea of Italy as it used to be and as we always hope it would stay entices you, Romagna is not to be missed. My experiences could not be synthesized into one post so the next few weeks will be dedicated to the area that has captured my heart. I am still, and will always be, #lovingromagna. I invite you to join me next week to explore a side of Italy that you have never seen. A presto!